A lot of companies stay away from RFPs. A lot of people think RFPs are a waste of time. However, those who consistently prioritize and pursue RFPs are successful organizations seeing positive effects. RFP response often bears a negative feeling for teams, but it certainly doesn’t have to. A new perspective coupled with technology are necessary if you are ready to make changes that will benefit your organization. An RFP isn’t bad—far from it, in fact. It is a great opportunity for your company if you have the right tools. These are a few of the positive effects RFPIO’s clients have experienced—and you can too, once you see RFP response in a different light. When an RFP arrives in your inbox, it’s a business opportunity. If your team doesn’t participate in RFPs, you risk losing the opportunity to the organization that goes after it. Let’s say you are participating consistently in RFPs. Are you putting your best foot forward to win? Or, are you going through the motions just to get the RFP project out the door? As with any pursuit, competition can be fierce. The only way to see the positive effect with opportunities is to outshine your competitors with the quality of your submission. The goal with every submitted RFP is to make your organization stand out as the obvious partner. Everything from the executive summary to key differentiators should be carefully crafted and tailored for your prospect. Boilerplate content won’t win anyone over. Think about the last time you received anything automated and impersonal, even if it’s an email. You likely already forgot that company, or you ignored the email and never saw the message. This is where RFP software comes in to help teams leverage technology for a stronger deliverable. Your answer library stores all of your company information in Q&A pairs, so you can quickly search for responses in one place—not fifty places—such as folders, emails, and spreadsheets. Tags make searching easier for your team and star rating influences the recommendation engine to highlight the best responses. After repurposing this content through the answer library, you can customize the response for the individual prospect to impress them. Use any sales intelligence to make your content relevant, and have marketing do the final polish for readability, brand alignment, and engagement. 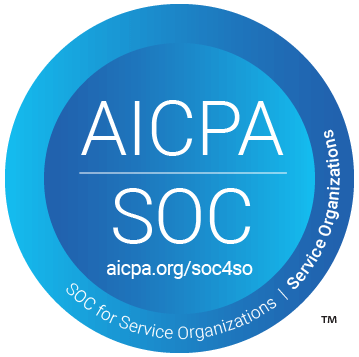 Company information changes constantly, whether you have a team of 50 or 50,000. A product company will have new features, technical specs, and updates, while a government organization will have security and compliance standards to maintain. Staying on top of the latest internal knowledge is critical for anyone at an organization who is involved in responding to RFPs. When companies rely on a manual approach, responses often end up buried in a spreadsheet without being updated consistently. Outdated content works against the end goal of any RFP…to win business. RFP software includes an answer library to centralize your company’s internal knowledge base, making the information easily accessible the next time an RFP, security questionnaire, or unsolicited proposal come up. Regular content audits ensure the most updated responses are front and center. With RFPIO, you can set up alerts to help admins remember to comb through the answer library, to clean up the content and make pertinent updates. Having this knowledge repository goes far beyond an RFP response project for your sales team. If you’re just selling on your own path, having this wealth of information handy refreshes company knowledge, security policies, and processes at a glance. Frontline salespeople are using RFPIO to answer technical or product questions on sales calls. They don’t need to tell the prospect to hold on while they try to find the information—or say they need to follow up or have someone get back to them. Many sales teams, including our own, leave the answer library on the screen during the sales call to share information that bolsters the conversation. The reason any organization responds to RFPs is in the hopes of generating more revenue. But, companies turn away from RFPs because of the time commitment they don’t want to invest for a potentially low win rate. This is an understandable challenge for companies. The thing they all have in common is they are still working with a manual RFP response process. 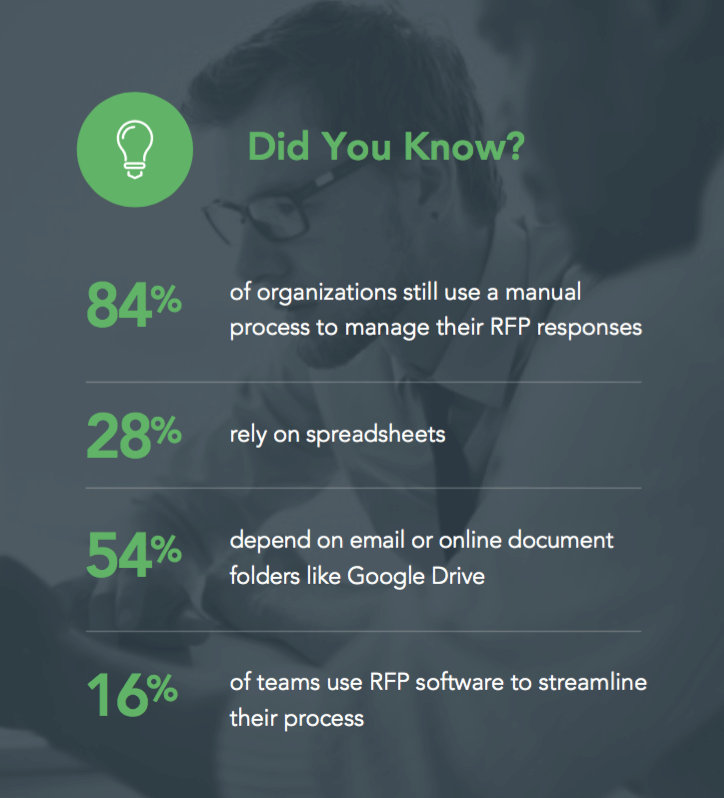 In our RFP response habits survey, we learned that only 16% of organizations are using RFP software. We have seen companies using RFPIO cut their response time in half. The time-savings is experienced companywide—from the SMEs taking time out of their day to contribute information to the proposal manager wrangling with a needlessly difficult import and export process. Being able to save time allows teams to prioritize other high-priority tasks, but also to respond to more RFPs. Without automating repetitive tasks, a team can only take on so many RFP projects. When the majority of the responses are populated by intelligent technology, that speeds up the process exponentially. Win rates are also positively impacted with RFP software—the Smarsh team reported a significant win rate increase with RFPIO. How? More time can be spent polishing the deliverable, so you submit a winning response. When your team isn’t rushing, they can focus on the quality. “Our company’s sales team uses RFPIO because it saves us a significant amount of time on RFP projects and, giving us the opportunity to participate in more RFPs with higher quality responses that ultimately help us win more business,” said Stephen Marsh. Listen to the podcast to find out how Smarsh wins more deals. Every RFP is a team effort, requiring expertise and strategy from diverse groups inside an organization. Marketing and sales, IT and product management—teams who work together in an office, and those who work in global locations. Silos happen, especially with information. These information silos can bring the RFP response process to a standstill. Information might be exchanged well within departments, but an RFP project pushes these boundaries so that teams must work together effectively. A centralized answer library is a key piece of the collaboration puzzle. Teams using RFP software will have an easier time accessing the right information, whether they are on opposite sides of a building or a map. Communication is another area that proves challenging during the RFP response process. Again, this goes back to a manual process. Teams are depending on emails or meetings to work on RFP responses together. Emails can be missed and meetings can take too much time. RFPIO brings easier communication between teams with @-mentioning within the solution, along with Slack integration. It’s simple to assign SMEs to a certain section of an RFP, so they can jump in and share their contribution. It’s also easy to ask for clarification on a response to speed up the review process, versus following up constantly by email. Collaboration always has room for improvement at an organization. Responding to RFPs is a great exercise for breaking down barriers and opening up the line of communication. From easier access to internal knowledge to better verbal communication, a stronger RFP response process delivers ongoing positive effects that trickle down into the daily lives of your team. Successful response teams are using RFP software to be more productive and do their best work. Since RFPs are a key part of the sales process, this elevated approach leads to greater opportunities and revenue. Responding to RFPs will make your team more effective as a whole when you are using technology that enables them to succeed. See the positive effect of RFP software in action. Calculate your ROI in a few seconds.